Properly chastened, I reminded myself of the humble beginnings of the Think Before You Pink® campaign. 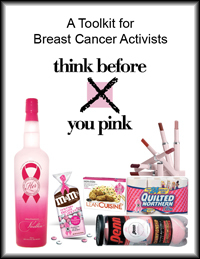 In 2002, BCAction launched a website with critical questions for consumers to ask about pink ribbon promotions, and examples of cause marketing partnerships. We also ran an ad in the New York Times, calling out companies whose pink ribbon promotions did more for company profits than for the breast cancer cause. At the time, this message was new and provocative– no one had ever said “pinkwasher” before, or urged consumers to think before they bought pink. Nine years later, the “Think Before You Pink®” message has gone mainstream—our “critical questions before you buy pink” are in wide circulation, “pinkwasher” has caught on like wildfire, and women are joining together to hold companies accountable for their breast cancer cause marketing. We cannot credit this huge momentum and national visibility to a large staff or marketing budget. In 2002, BCAction had a paid staff of 6 and a very lean budget, and the remarkable success of Think Before You Pink® has been entirely grassroots. We’ve achieved so much together because people like you talk to everyone you know during October and beyond about the truth behind pink ribbon marketing. Fast forward to 2011—BCAction has a paid staff of 9 and a very lean budget (do you see a pattern?) A few months ago, when BCAction’s program team was starting to plan for this year’s Think Before You Pink® campaign, we asked ourselves, “How can we take the campaign to the next level? How can we build on this awesome grassroots momentum?” We have an answer for you, and we hope you will invest in the next phase of this campaign. We need a national grassroots groundswell to really change the conversation about breast cancer in this country. 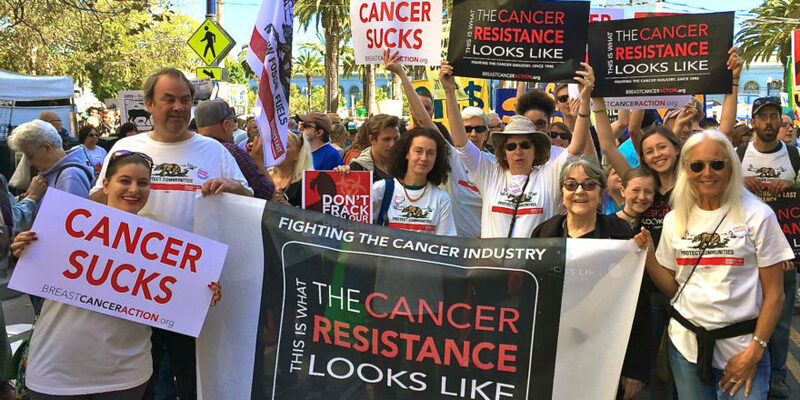 To do that, activists across the country need resources and information to help your communities learn the truth about pink ribbons and the breast cancer epidemic, and how it connects to the conflicts of interest rampant in the cancer industry. Enter our brand-new “Think Before You Pink®: A Toolkit for Breast Cancer Activists.” The toolkit is full of resources, information, and tools you need to understand the truth behind pink ribbon marketing, the rampant conflicts of interest in the cancer industry, and why breast cancer rates are not declining—and help others learn about it, too. Please, help us take Think Before You Pink® to the next level. Join 95 activists across the country who have invested $10 or more in the campaign and received a sneak peek of new toolkit as a thank you. To see the awesome national reach the toolkit already has, click here. If your town isn’t on the map, get it on the map today! In another 9 years, I want to stomp around the office, furious because the National Cancer Institute and Susan G. Komen for the Cure copied all of our material about conflicts of interest, environmental links to breast cancer, and pinkwashing, because so many people raised hell about it. Nine women cannot turn the tide of breast cancer, but 100,000 can. We cannot end this epidemic while pink ribbon marketing remains the status quo of breast cancer activism, and to change the tide of breast cancer activism, we need you raising hell with us.